This movie takes off at the beginning and doesn't let up till the end. The action and suspense is done well, but by the end of the movie you are thinking "Seriously? Again?" The lady next to me was literally on the edge of her seat...leaning forward. She gasped at all the appropriate moments and I think she even covered her mouth with her hand at one point. If I didn't know better I would think she was a plant by the studio <G>. I saw the movie with my husband and 14 year old daughter. It is straight up action with all the disaster movie cliches. You've got the recently divorced couple who must work together to save their beautiful well-adjusted daughter and then find love again. There is some cheese in the dialogue, especially with the over dramatic scientist who saw it coming, but no one would listen to, and lots of soul-bearing moments. Plus all the over top no-way-would-they-survive-that scenes. They follow the formula to the letter. In spite of all that, it is an entertaining movie. Big special effects, edge of your seat action (obviously) and if you like the trailer you will like the movie. This is probably best appreciated on the big screen and worth a matinee price if you are an action movie junkie. And spending two hours watching Dwayne Johnson isn't a bad way to spend an afternoon. It wasn't bad. Had some flaws - like a scientist who wouldn't save himself even though he clearly had time to do so in "movie time," and tip the hat, and no bodies in the water around the city... :P But overall action-packed and if you can "Let it go" you'll enjoy it. yeah, I kept leaning over to my daughter mentioning the water would be filled with bodies and debris. They would have never been able to cruise around like that...and there was NO ONE else doing that too. Had to let that one go to enjoy . 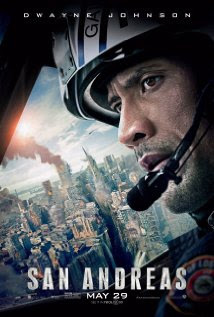 I heard that this was one of the better disaster movies :) Yeah I figured movie cliques all around . It is better than most others I've seen.